52 Week Money Challenge for Kids ! Download this free 52 Week Money Challenge, specifically aimed to help kids learn the value of saving, earning and hard work. Teaching kids early on that there is a way to save if you have a plan on this 52 week money challenge, aimed directly at money that kids can earn, is a great way to demonstrate the power of compounding your cash. The new year means a lot of things to a lot of people. New ways to take the weight off, new ways to serve the community, find a career you love, and yep, our commitment to new ways to earning and saving money. In my house, a new year is also a great chance to assist my kids with their own goals. This year I wanted to share a FREE 52 WEEK MONEY SAVING PRINTABLE that is perfect to challenge your children to earn, and save, the money they create. And as we are in week 1 of January, its the perfect time to get this downloaded and started no matter the age of your kids! What I love about this money saving challenge is the twist on encouraging your kids to start in January for a savings they can see by Christmas. You may offer chores and allowance in your home or help your kids (depending on age) or source additional ideas for them to earn, but with the small amounts of money needed each week, which shows the stack up on the money savings challenge sheet, nearly any child can benefit by seeing the value in hard work and savings. If your kids are getting ready to embark on a money saving challenge, give them a way to see their success! 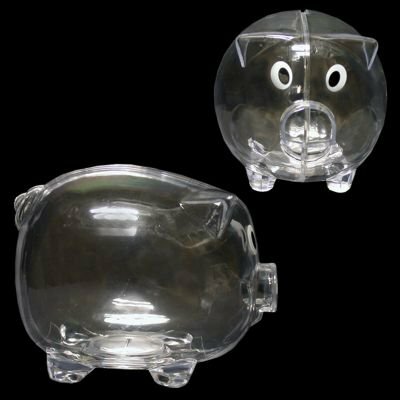 There are numerous amounts of piggy banks available on the market. I love the ones that count the money so you can see the total going up. I also love a clear piggy bank so your youngest can easily see the results of what they are doing. 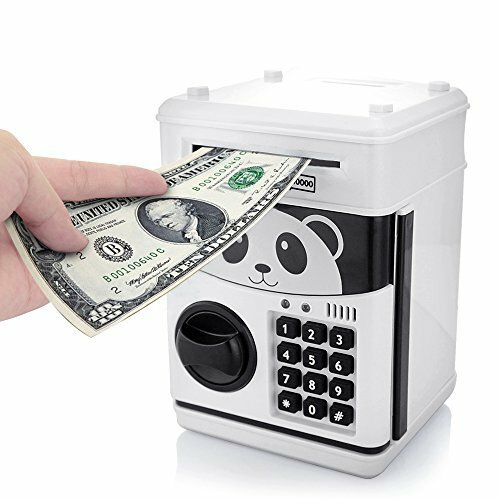 Some kids may like a novelty bank. Either way, you should pick one up so they get the feeling of the importance of savings, which helps support a healthy ongoing relationship with putting money away. My picks for a rewarding challenge below! I have created this free 52 Week Money Challenge for Kids printable that you can give to your kids. Take the time to talk to them about how little bits of money can turn into a lot! This is also a great time to talk to your kids about how they can earn around the house and what they can be doing to get to the goal each week. By simply growing just a quarter EACH WEEK for the entire year, your child can put away enough money for a savings account, to purchase family Christmas presents on their own, or add it towards a larger goal they may have. And because each week they need to earn just a bit more, they should be doing more work as well and understanding how hard work combined with savings can be the key to long term success! I also left the printable blank so you can start ANYTIME at all and are not limited to January. Just add the week you start and go forward. Hit the image to download our FREE Money Savings PDF file that you can print off. Need some ideas for your kids to earn? Stay tuned later this week for an article on what I suggest kids do to earn each week based on age. 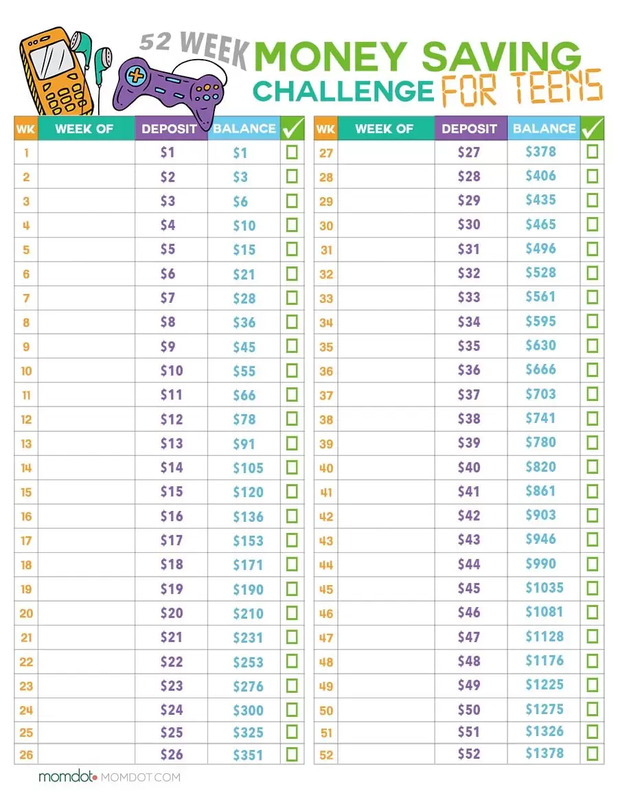 If you have teens that are working, you may like this 52 week Challenge Printable for Teens, which has a higher balance and donation achievement. Teens are closer to being an adult, so the money value went up and should help them save over $1300 this year with using this simple match formula. Click below to be taken to the newest download. Of course you do not have to be a kid to save. Simple ideas like this money challenge are also great for adults as well! 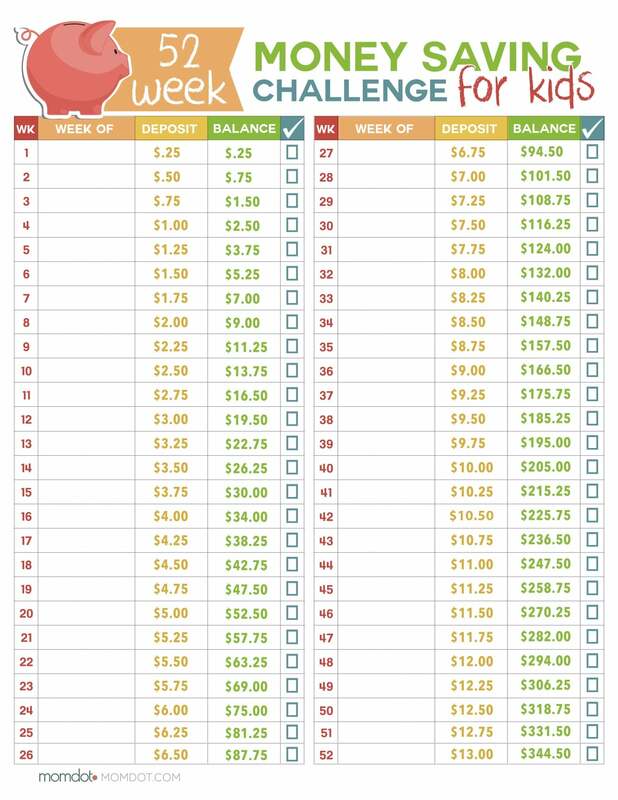 Print off this 52 week money challenge, throw in a lamination sleeve, and check mark your progress as the weeks go by. Have you used this printable and saved? Love this idea! 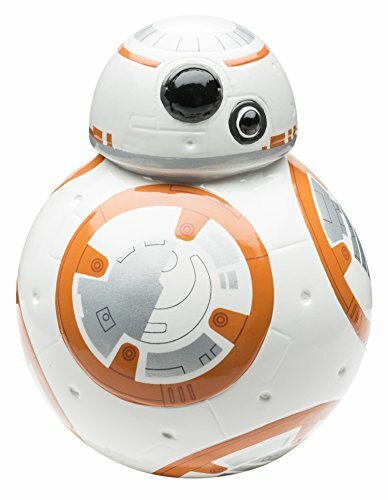 My son is 8 and it would be perfect for him.